Pioneers of Sustainability | Doris S. Michaels Literary Agency, Inc. 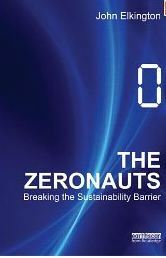 THE Zeronauts, says John Elkington, are pioneers of sustainability, making previously unimaginable contributions to reducing humanity’s footprint on the environment, which is ultimately a footprint on fellow human beings. Elkington describes the modern corporation as a remarkable and powerful invention, but also points to research suggesting it is an institution that seldom produces significant leadership. In this culture, Zeronauts may be in short supply, but there are encouraging signs of the move towards zero. Sweden aims for an oil-free economy by 2020; Denmark will cut out all coal and oil by 2050 without resorting to nuclear power; the US General Services Administration, the biggest public works department in the world, has set itself the goal of zero environmental footprint. By 2020, PepsiCo plans to make its operations fossil-fuel-free, have its largest factories achieving zero water intake, send nothing to landfill across its entire supply chain, and make all product packaging from renewable resources. These trends may be inspired by idealism but are made practical by substantial cost savings. South African companies are notable for their absence from Elkington’s list of sustainability heroes. While the local business sector has shown some degree of global leadership in its response to initiatives, there is not yet a broad recognition of the deep social and moral dimension to sustainability — to say nothing of the opportunities it presents. This may be because many companies are up against the reality that their businesses are inherently unsustainable, and so trying to make them sustainable is rather missing the point. Coal power will never be sustainable, mining finite resources will never be sustainable, and fuelling obesity with sugar-laden processed foods will never be sustainable. The Zeronauts, Elkington concludes, are “ambassadors from the future”, plenipotentiaries whose gifts and visions of unseen realms we mock at our peril. Elkington is a world authority on corporate responsibility and sustainable development. His first contribution to the field was raising money for the newly formed World Wildlife Fund in 1961, when he was 11. Recognised as a “a true green business guru” and “an evangelist for corporate social and environmental responsibility long before it was fashionable”, Elkington was among the 1,000 Most Influential People in London in 2008, as named by The Evening Standard. He is a founding partner and executive chairman of Volans, a future-focused business working at the intersection of the sustainability, entrepreneurship and innovation movements. He is also a co-founder of SustainAbility, where he remains a nonexecutive member of the board, and of Environmental Data Services. He was placed fourth in the 2009 Corporate Sustainable Responsibility (CSR) International survey of the top 100 CSR leaders after Al Gore, Barack Obama and the late Anita Roddick of the Body Shop, and alongside Muhammad Yunus of the Grameen Bank. Last year, he was awarded the Spencer Hutchens Jr Medal by the American Society for Quality for his outstanding leadership as an advocate for social responsibility. • Kendall is deputy director of the Cambridge Programme for Sustainability Leadership’s South African office.